I hope you all had a most delightful Thanksgiving (if you live in the US)! Instead of braving the masses to shop on Black Friday, I actually found myself working..serving those who were out and about that day! It wasn't as crazy as I thought it would be, and somehow found it to be enjoyable. This weekend was crazy busy with styling clients, work, speaking engagements and a concert to attend. Oh the joys of the season..I do love going from one fun thing to the next! The holiday season is in full swing now, and I'm looking forward to some exciting events, the decorations and the excitement of the season that seems to be in the air. I just love this time of the year. Love, love, love the outfit! So beautiful! i wish we lived closer so i could borrow everything in your closet. ya know, when i'm back done to my pregnancy weight and can rock it like you do. umm..legs for daaays! Can I have them please? 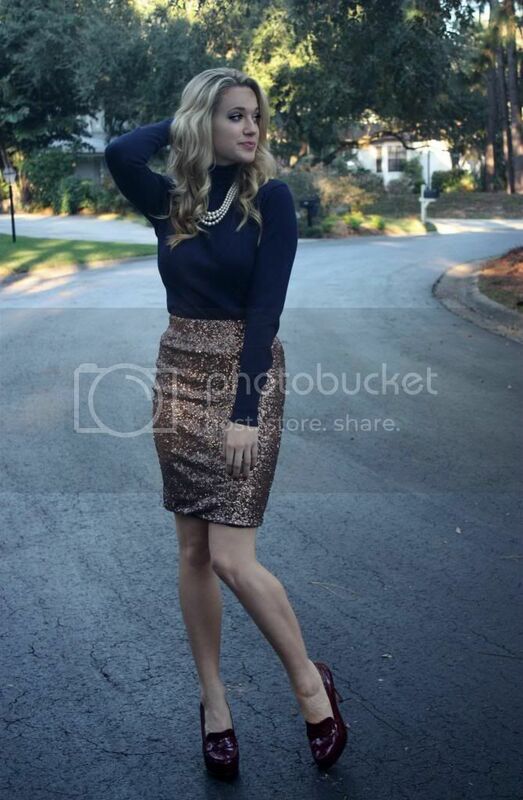 I used to hate the shimmery skirt look but I'm starting to LOVE it this season! 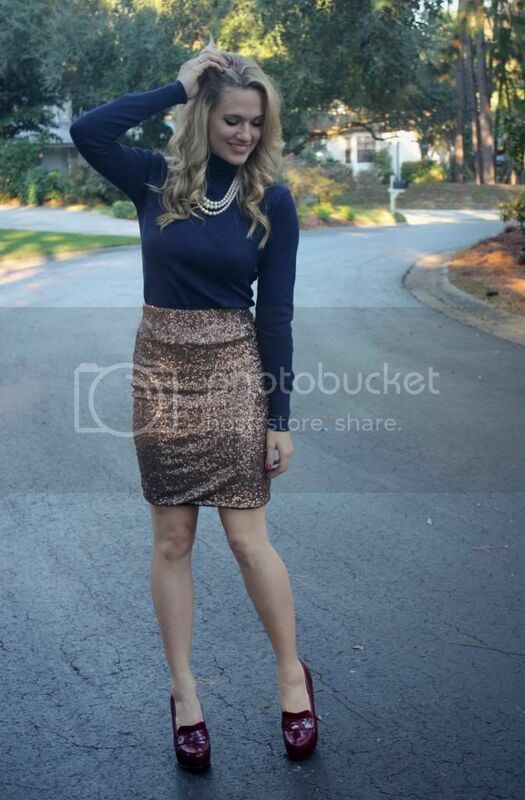 Navy is a perfect compliment to the bronze sequins. Love this look! Oh, wow! This outfit is perfect. Love the shoes and skirt especially. You're a stylist? I would love to hear how you started... that's my dream! Love this look! You are stunning! Love the skirt! Can't wait to hear more about what you're doing after having graduated!